Botulinum toxin (BonTA) exerts its main therapeutic by inhibiting neuro-mediator exocytosis . This was originally seen with acetylcholine hence the first diseases to be treated with BonTA injections where ocular strabismus and other striated muscular conditions . In urologic diseases use of BonTA also started with application to striated muscle. In this case the urethral sphincter was targetd for treatment of sphincter-detrusor dissynergia in spinal cord injury patients . With the rationale of smooth muscle relaxation, intra-vesical injections where approved initially for neurogenic detrusor over activity and later for the idiopathic overactive bladder syndrome. These applications showed great success and presently are mainstays of neurogenic and idiopathic bladder over activity treatment [4–6]. 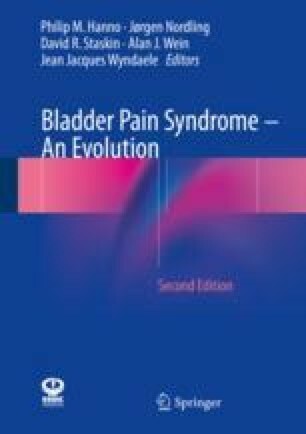 Since both the toxic effects as well as therapeutic effects of BonTA were seen as an efferent neuronal effect it was initially overlooked in the treatment of bladder pain.